We stock a range of siliconised cake tin liners from Tala including liners for 1lb & 2lb loaf tins, 20cm & 23cm cake tins and baking trays. These cake tin liners and baking tray spray are ideal for quicker, cleaner baking with no hassle of greaseproofing the tins first or cutting up of baking paper to fit, just pop them into the cake tin and pour in the mixture. The cakes then just pop straight out of the liners without fuss once cooking has been completed. We also have an extensive range of traditional non-stick baking papers". 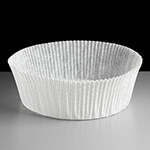 The Tala cake tin liners are suitable for cooking up to 230 deg C and can be wiped clean and reused after use.